Most dentists reduce the teeth first and then check to see if they have enough reduction. I find this a difficult way to accurately judge if you have done enough reduction. By placing the depth cuts first, then preparing the teeth so that the cuts are no longer visible, you assure proper reduction. It’s just that simple. You will never receive a call from your laboratory or another reduction coping again. 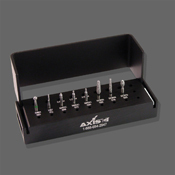 The Reverse Preparation Technique kit is made by Axis Dental and is available through dental dealers. 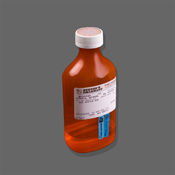 DYC rinse is helpful to almost any patient having something done who is not getting local anesthesia. 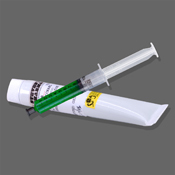 Since typically, we only use local anesthetic for our root planing patients, DYC rinse helps fill the gap by being an easy to use topical that provides peace of mind for the patients. It is used on full arch crown and bridge impressions, when we are worried about gagging while trying to capture the detail of multiple preps. We will even use it prior to taking our digital x-rays on patients who are worried about gagging. DYC rinse is available in both lemon and mint. PFG gel has allowed me to do lots of gingival recontouring and other soft tissue procedures without the need for local anesthesia. Profound has also allowed me to almost eliminate lower blocks from my day to day practice. My technique is to leave the PFG gel on for 60 seconds, rinse it off, and then pierce the mucosa with the 30 gauge needle as I pull the tissue taut. I keep a tube of original PFG gel in each operatory for the gingival recontouring touch-ups that seem to pop up in almost all of our esthetic cases. PF Lite was formulated with those dentists in mind who use PFG gel more for pre-injections than for laser surgery. It still has the same powerful combination of prilocaine, lidocaine and tetracaine, but the ratios have been adjusted to make it friendly to all oral tissues. Since I switched to PF Lite I no longer see the tissue dehydration that I did before and the patients still don’t feel the penetration of the needle. To be honest, I used to make fun of devices like this in my lectures. 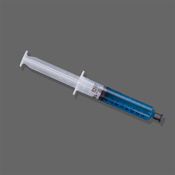 I always wondered why I would need a $1,500 product to do what I could do with a $20 syringe. Did I really need a computer to give a slow injection for me? Hadn’t I been giving slow injections my whole career, much to the pleasure of my patients? Before I tell you about what I love about the STA SystemTM, let me tell you why I decided to buy it. I always hated having to give a carpule on a lower block and then remove the syringe, load another carpule, and reinject. I have long dreamed about a double sized carpule. 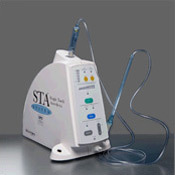 When I saw that the STA System allows you to load a second carpule without removing the needle, I was sold. It had me at hello. What I didn’t realize was how stress free it makes injections, especially when you have to give multiple maxillary infiltrations.